Early this year, I created a video work entitled WEST. 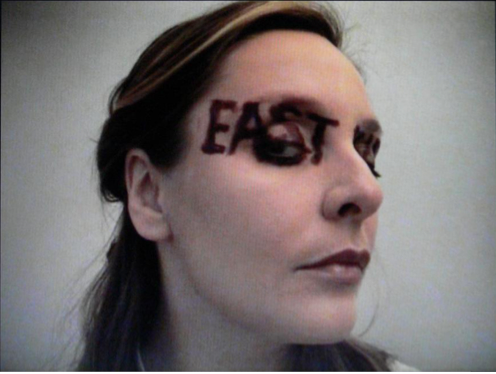 The video is a self portrait with two words written over my eyes – one word is EAST, the other is WEST; the words symbolize the division of the world. At one point in the video, I erase the world EAST from the surface of my face, suggesting thereby the erasure of the EAST part of the world, as the weaker of the two. 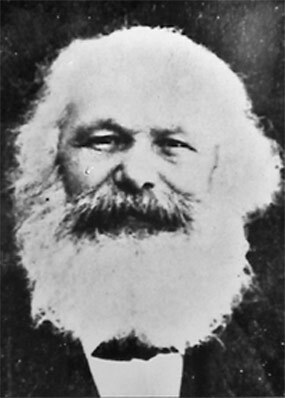 With this erasure comes the imposed dominance of the WEST, as a so- called ‘ideal’ socio- economic model. This violent moment of erasure in the video, coming from someone who in many ways identifies with the Eastern part of the world, reads as a painful mo- ment. Since creating this work, I have been pursued by a particular thought: why do we, as artists, have the urge to destabilize the established sense of normality? Are we servants of a creative process or servants of a process of destruction? Is the creative act in function of establishing a new conception? Is the artists’ way in reality a brutal vision, or perhaps a premonition of political proc- esses and realities that belong to the future and might have belonged of the past? The geographical region selected for the project LOVE HATE is the area defined by former Yugoslavia. It has been chosen because of the particular political and economic situation that has evolved there since the death of president Tito in 1980 – and the subsequent dissolution of the country. The ‘universal situation’ applicable to the current state of the newly established countries in that region, is popularly known as the phase of ‘Transition’. The ‘Transition’ in this area is not related solely to the transformation of society from a Socialist system to one of (apparent) Liberal Democracy. There has also been a long civil war and a post-civil war period, which have contributed to the sense of ‘incompleteness’ of these ‘new’ societies. There has been no sympathy for the past (socialism), no peace in the present (corruption, nationalism and economic exploitation) and no belief in the future (massive migration, the continuous fear of further political and eco- nomic instability, etc). The video projects featured in October’s TANK TV on-line exhibition, inhabit the very territory named ‘transition’ and reflect the relation between the past, the present and the future. In Nemanja Cvijanovic’s video project Marinetti vaffanculo featuring Spielberg, the artist sings along and whistles the tune of the song ‘8 souls blown up by a single bomb’, borrowed from the futuristic poet F.T.Marinetti. By performing this casual act, the artist adds a cynical aspect to a grotesque scene from Spielberg’s war film ‘Saving Private Ryan’, and in so doing, Cvijanovic ‘has a laugh’ with the past, present and the future. He looks ironi- cally at human nature and the realities of any war, questioning whether Hollywood’s special effects are intended to make us numb to the pain around us, making horror become a part of our everyday lives? During World War 2, about 1.7 million Yugoslavs died fighting the fascist opposition; during the Yugoslav civil war, more than 250,000 ex- Yugoslavs died fighting each other. Does this not suggest that life has little value, that life and death can be simulated as a purely ‘cinema effect’ as required for a particular political or territorial ambition? 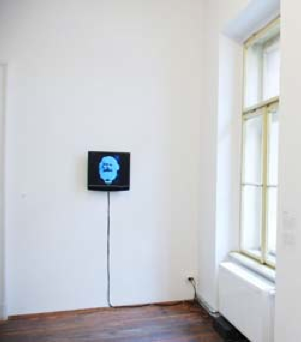 Nikola Uzunovski, in his minimalist work entitled Snowfall, brings back a particular teenage memory related to the time of Socialist Yugo- slavia. 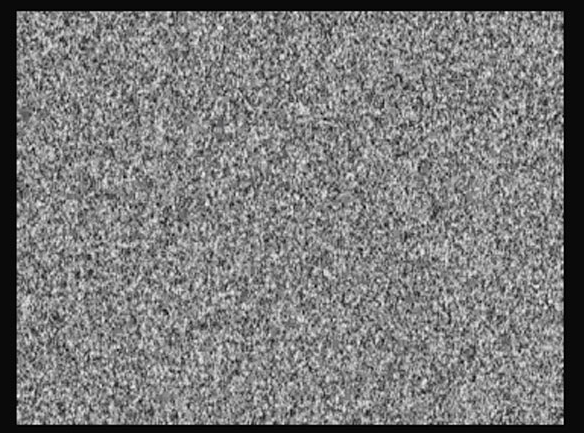 When we were in our teens, there were only two TV channels, which both finished at about 11pm… The sleepless night hours were filled with the hypnotic emptyness coming from the TV screen, filling the whole room with the flickering soft light. The next video work continues the critique of the media, and the manner in which it impacts the picture of reality. 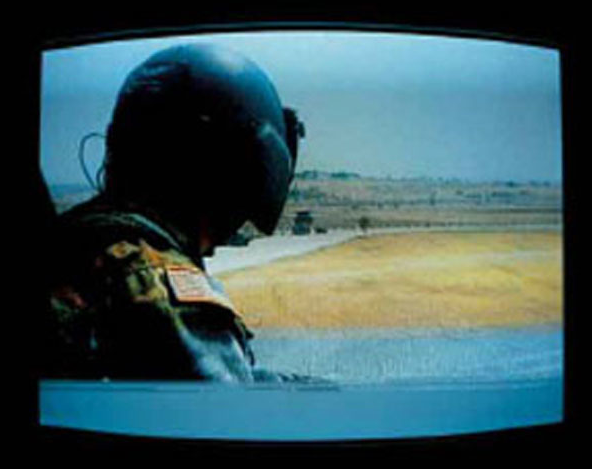 The video work entitled Essen- tial Harvest, by artist Zaneta Vangeli, uses solely raw TV footage of the NATO Operation carried out in Macedonia in August 2001. This operation, entitled Essential Harvest (from which the video work borrows its title), was a complex and costly “peace keeping operation” involving over 3500 NATO soldiers. Their task was to stabilize, in 2001, the post-conflict situation in Macedonia through the collection, categorization and subsequent destruction of all conventional weapons and ammunition existing in the country. At the con- clusion of the 30-day action, approximately 3000 pieces of weapons (for the most part, older or even anachronous models) were collected and destroyed. Unfortunately, the more accurate number of illegal, technologically advanced weapons in the country at that time was estimated at over 100.000 pieces. This work is one of the most direct illustrations of the ‘face of transition’. In this video work, Essential Harvest, Vangeli does not dwell upon the relation between Love and Hate; instead, she takes the position of her nation as a mes- senger to the world about the true nature of real-life events. What fascinated me is that Vangeli’s statement is an accurate representation of the real facts – that, infact, there were over 100.000 pieces of weapons in the area in 2001. She does not take part in either side, by stating, for example, that all the weapons (all 100.000 pieces) belong to the ‘enemy’ forces. Instead, Vangeli simply recognises the presence of the devil (what she would call ‘Sejtan’) within human nature. 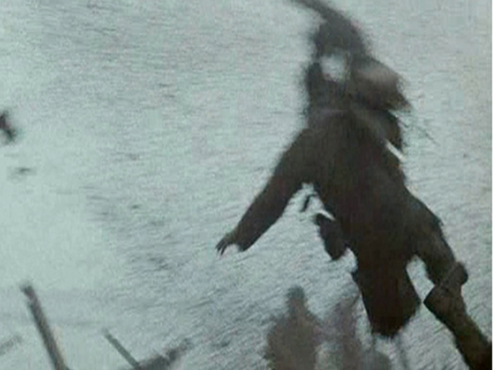 Atom Egoyan’s film ‘Ararat’ (2002) and Kiril Ce- nevski’s ‘Black Seed’ (1971), both portray historic (yet relatively unknown, or less recognized) moments of oppression and genocide. Both directors paint a picture showing two sides – one good, the other bad. They choose to frater- nize – as is to be expected – with the side of the victims. The formula is straightforward – the creator (film directors) identify with the victims, thereby representing the suffering of their own nation with a vengeance. By contrast, in Vesna Milicevic’s video work Somebody Else’s Daughters, the artist decides to speak out against her own nation. She does not hide the truth, as has been done in numerous instances by various politicians and historians. Vesna Milicevic chooses, instead, to give a human characteris- tic to both the victim and the aggressor; the victim is a Romanian girl while the perpetrators are men, involved in human trafficking for the purpose of prostitution within the area of ex –Yugoslavia. the situation of the transition between two systems where mon- strous acts, such as the one depicted, can become an unfortunate reality. The next video work, entitled Masturbation, by young female artist Olgica Dimitrovska, again exercises a Love and Hate position. Dimitrovska is a young artist; memory does not reach the ‘vividness’ of the past as it does in the work of some of the other artists represented here. Instead, her work reflects and comments on the presence of the momentary. On a simplistic level, we, as observers of this work of art could ask ourselves: does the artist love herself to such an extent that she needs to show it off? Or else, of the methodology of the video project, we could ask: ‘To what degree does the artist hate the sys- tem in which she lives? To what extent does the system’s / society’s puritanical and backward views provoke the artist to re-examine her own position and existence, as a sexual being, within this biased value system? The time of transition has, once again, in the desper- ate search for stability, taken a leaning towards the American life model, with its image of the ‘perfect family’, with it’s excess accessories for the home, oversupplied supermarkets, in the search for superficial stability… Dimitievska’s work cries out to break that system. Contemplating the state of transition occurring in the Eastern Block, one ‘suicidal’ aspect that keeps these societies in a constant state of ‘transition’, is their complete rejection of the past and the values of the previous socio-political system. In other words, their conviction that everything needs to be ‘new’ in order to serve the ‘transition’ well. The final two video works, by contrast, glorify the values of the past socio-political system, by not neglecting their positive out- comes. In the years of crisis in Serbia, in which it suffered the disrespect of all nations, when all the borders were closed, and the unbearable economic crisis was challenging the lev- els of the human endurance, the Belgrade based duo Skart found ways of bringing back hope to the people. 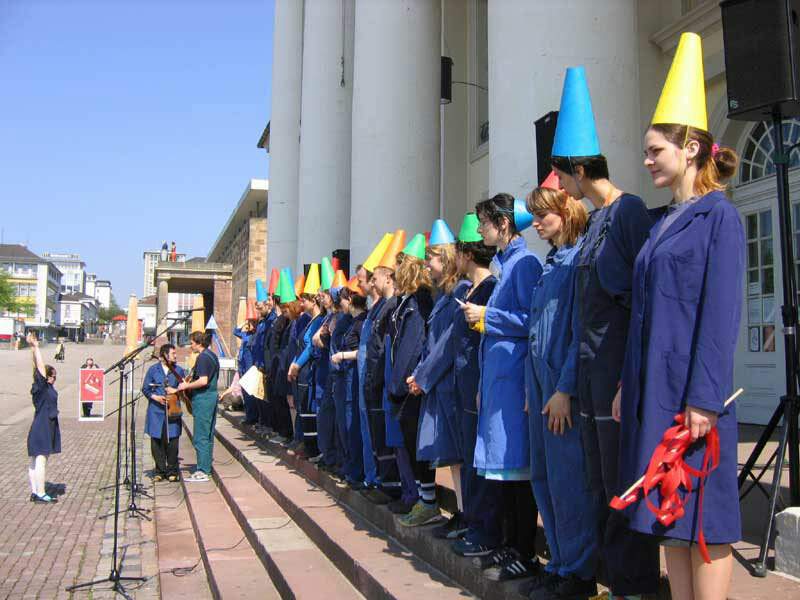 Their arts project HORKESKART consisted of creating a choir of forty young people, named HORKESKART which drew inspiration from the manner of choir singing typical of the days of socialism, with its characteristic element of praising the country, paying homage to the leader and the socialist system, etc. Traveling around cities and villages within the territories of former Yugoslavia, as well as beyond, HORKESKART performed the same heroic songs (including many partisan songs) that were characteristic of the post WWII period, designed to raise the morale of the nation during the early days of the newly formed socialist Yugoslavia. Although the songs were now being performed by the choir within the context of a different political system, thy have ignited a similar emotional charge and provided a sense of hope to individuals now belonging to a different social environment.